What makes The Junction special? This is a question that was recently explored by a comprehensive historical survey that examines West Seattle’s historic business district for landmark potential. The survey includes the views and opinions of Junction building owners as well as members of the community. 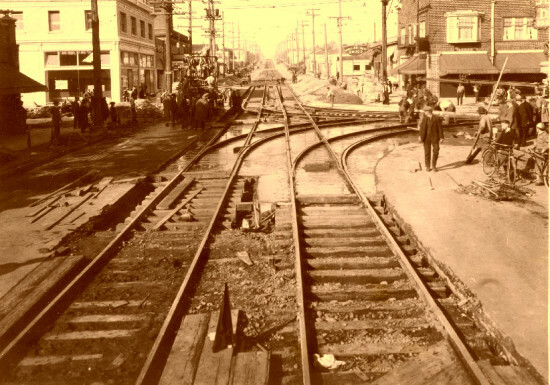 This is the first time that the historical character of the West Seattle Junction has been documented in a professional survey. California Avenue and Alaska Street, looking north, 1926. Survey of the 58 buildings in The Junction that are at least 40 years old. This survey was conducted by architectural historian Mimi Sheridan of the Sheridan Consulting Group and was supported by a $10,000 grant from 4Culture. This part provides a historical overview of The Junction and evaluates whether buildings appear eligible for designation as Seattle landmarks. Two buildings were identified as possibly eligible, including the Campbell Building (1918) and Hamm Building (1926). Six others were also identified, pending further research, including the Hotwire/dental complex (1910), the Courtesy Accounting building (1947), the J.F. Henry building (1908), the former J.C. Penney building (1926), the Curious Kidstuff building (1928), and the Technical Analysis building (1961). Summaries of interviews with nine Junction building owners: ArtsWest, Steve Athan, Jack Calvo, Leon Capelouto, Jerry Costacos, Tom Henry, John and Lisa Kennan-Meyer, Jack Menashe and Jack Miller. The owners address the history of their buildings, what they love about their buildings, what makes The Junction special and what about The Junction should be preserved. Summary of a public survey conducted during the summer of 2015. More than 260 people identified their favorite Junction buildings, what they think makes The Junction special and what about The Junction should be preserved. This report will hopefully add to an important conversation about how West Seattle’s main business district should move forward into the future and what pieces of our history we should preserve.